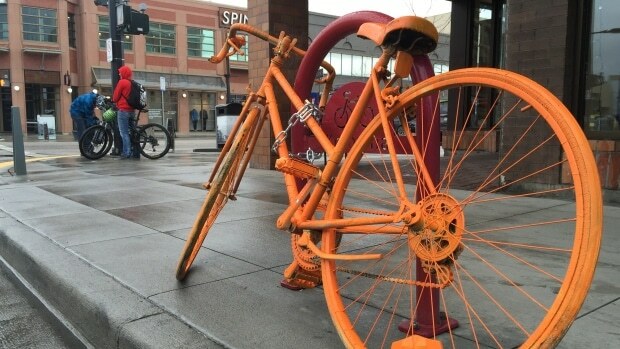 A fitness brand has been trying to drum up new business with an interesting guerrilla marketing strategy, placing orange-painted bicycles around a town in British Columbia, Canada to grab the attention of passersby. Orangetheory Fitness has spray-painted six pedal bikes and situated them in Kelowna ahead of the opening of a new studio there later in the spring. Ryan Williams, who is operations manager of the fitness centre, said this is just “fun marketing promotion”. “People associate the colour with our brand. We rotate (the bikes) around town for a few weeks and we’ve got a good response from it so far,” he stated. Orangetheory Fitness has certainly boosted its publicity with the stunt, particularly as the campaign has caused controversy in the area. This is because the town has a history of situating ‘ghost bikes’ painted white to remember those who have died in cycling accidents. The Kelowna Area Cycling Coalition placed ghost bikes in two locations in 2015, and this practice has been adopted in other cities in memory of cyclists killed in traffic. However, Orangetheory Fitness has been seen to capitalise on this with the placement of their orange bicycles. While the orange colour has been likened to the colour of safety vests, it is intrinsically linked with the brand. Indeed, Orangetheory Fitness is so-called as its philosophy requires members to exercise for an hour in a workout designed to push them into the ‘orange zone’, where their metabolic rate remains risen for up to 36 hours afterwards, enabling them to burn more calories.